The See-Saw Balance physics activity. Along with the slide, swing and merry-go-round, the seesaw has won a coveted place in playgrounds around the world. But in addition to being a children's toy, the seesaw is actually a fascinating device that uses the same principles of physics at work in cranes, hydraulic lifts, bottle openers and fingernail clippers. In its simplest form, a seesaw is a lever: a long, rigid arm (like a board or a pole) that hinges on a pivot point called a fulcrum. Strictly speaking, a lever is actually a machine -- a device that transmits energy in order to do work -- and by work, we mean the act of exerting a force on an object over a distance. Seemingly miraculously, a lever does the work for you, allowing you to lift objects you'd never be able to budge by yourself. This explains why the term "lever" comes from the Latin word for "lift" and why Archimedes famously commented, "Give me a place to stand and rest my lever on, and I can move the Earth." Think about pushing a door, which is another kind of lever. If you push near the hinge, it's pretty difficult to open. By comparison, it's much easier to push on the end of the door opposite the hinge, and it's best to push at right angles to the door. This is a result of the principle of torque, or the force of rotation. Torque is the product of the rotational force exerted at right angles on the lever, times the distance between the point of force and the fulcrum. Children understand torque instinctively when they're riding a seesaw. 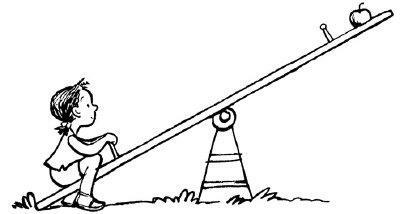 If two children are roughly the same weight and they're each sitting on the ends of the seesaw at points equidistant from the center, the whole thing will be balanced because they're exerting equal and oppositely directed forces (gravitational force, or weight). However, if one child is significantly heavier than the other, the heavier one will have to move closer to the center to achieve this equilibrium. Altering the force's distance from the fulcrum obviously affects the rotational force exerted on the other side. So what does this classic playground fixture have to do with lifting impossibly heavy objects? A 50-pound (22.68-kilogram) child would probably not be able to lift a 100-pound (45.36-kilogram) child on his own, but he can easily do this on the seesaw just by changing positions. But notice that the lighter child will travel a farther distance (up and down) than the heavier child. The fulcrum of a lever allows us to easily manipulate the relationship between force and distance. The same principle is at work when you use the claw of a hammer to remove a nail. Pulling the nail straight out is more difficult than resting the hammerhead (the fulcrum) and rolling it with the end of the handle (the lever arm) to pull out the nail. The arc of your hand will follow a longer distance than if you just tried to pull it straight out, but you'll be exerting less force to do the same work. Now that you know how simple this science is, look around, and you'll notice the astounding number of machines and gadgets that use these same basic principles, from industrial cranes working atop city skyscrapers to the bottle opener in your kitchen drawer.